The first dock at Newport, the Town Dock, opened in 1842 and was extended in 1858. But coal exports soon exceeded its capability and two more docks were opened by the Alexandra Dock company in 1875 and 1892 with a further major extension opening in 1907. However it was discovered that the locks were insufficient to handle the increase in shipping and work commenced on a great sea lock, more than a thousand feet long, that gave access to the docks directly from the sea, without the need for ships to negotiate the river. Whenever ships put to sea or docks were constructed to enable them to load and unload, accidents of one sort or another were never far away. Newport seemed to have had its fair share of them and dealing with the aftermath was always part of a policeman's lot. The Town Dock continued to trade for many years but it was sold to the Alexandra Dock company following an accident in 1882. On 10th January that year, two ships tried to pass through the lock at the same time but one, the Primus struck the sill of the outer gates and became stuck. The second vessel collided with the Primus and also became stuck fast, blocking the lock gates. As the tide receded the vessels heeled over on top of each other. The Primus lost her masts and broke in two; both vessels lay wrecked inside the lock and put it out of operation for two weeks while clearance work continued. Ships could neither enter or leave the dock during that time and it was an expensive accident for the Town Dock Company to have to bear. It was during the construction of the new sea lock in 1909 that a particularly tragic accident occurred. At 5:20 in the afternoon on the 2nd July, just minutes before the workers were due to finish for the day, the west wall excavation trench collapsed. Supporting timbers suddenly gave way and the trench fell in burying 46 men working inside it. Many men rushed to the scene and began an almost futile rescue of the trapped men. 39 men were killed with many of the bodies remaining entombed; three months after the accident there were still 33 bodies not recovered. (There had already been five previous fatal accidents during construction work.) Immediately after the collapse, one man, Tom Lewis, put his own life at considerable risk when he made a particularly heroic attempt to save the life of a trapped man. Tom Lewis was awarded the Albert Medal for his deeds and was presented with the medal by the king. Alexandra Dock constable Rueben Minns worked throughout the night and was awarded a Certificate of Meritorious Service for his part in the rescue attempt. Minns served with the Royal Army Medical Corps of the London Regiment and the 1st Battalion, King's Royal Rifles during the First World War. He rejoined the police at Newport Docks in 1918 and finally retired as an inspector at Cardiff Docks in 1951. On the 13th July 1939, just prior to the outbreak of the Second World War, an explosion occurred on the ss Welsh Rose at Newport Docks. The Chief Officer was trapped below decks. One of the first people on the scene, within just a few minutes, was Pc Loveridge. He worked untiringly amongst the burning debris, and at great personal risk, trying to reach the Petty Officer and succeeded in finally extricating his lifeless body. Pc Loveridge was commended for his exemplary conduct. On the 14th of August 1958 a KLM Royal Dutch Airline Lockheed Super Constellation crashed 120 miles out into the Atlantic after taking off from Shannon Airport. All 99 people on board the plane were killed. Some wreckage and 34 bodies were recovered from the site of the wreck but due to the depth of water where the plane went down no salvage attempt was made. Some of the wreckage was recovered by the ss Rievauix and was taken to Newport Docks to be handed to the police for transfer to air accident investigators. Late one evening in 1975 a private car was accidentally driven over the edge of the quay and into the dock at Newport. The driver was quickly able to get out of the vehicle and instead of rushing immediately to the surface, he remained underwater long enough to help his two passengers escape. All three men were safely recovered from the water and the driver was being hailed as a hero. Sergeant Allan Botwood made arrangements for the vehicle to be lifted out the following morning. In the meantime, a complaint was received from the master of a vessel that a theft of ship's stores had taken place. Intrigued at the coincidence of these two events, Sergeant Botwood made sure he was on hand when the car came out of the water the next day. He went straight to the boot and opened the lid to find that sure enough, it was full of the missing booty! The driver, together with his two companions, quickly went from hero to villain and instead of receiving congratulations he got a summons for theft instead. Prime Minister Harold Wilson visited Newport Docks in 1967 to open a major new timber wharf. 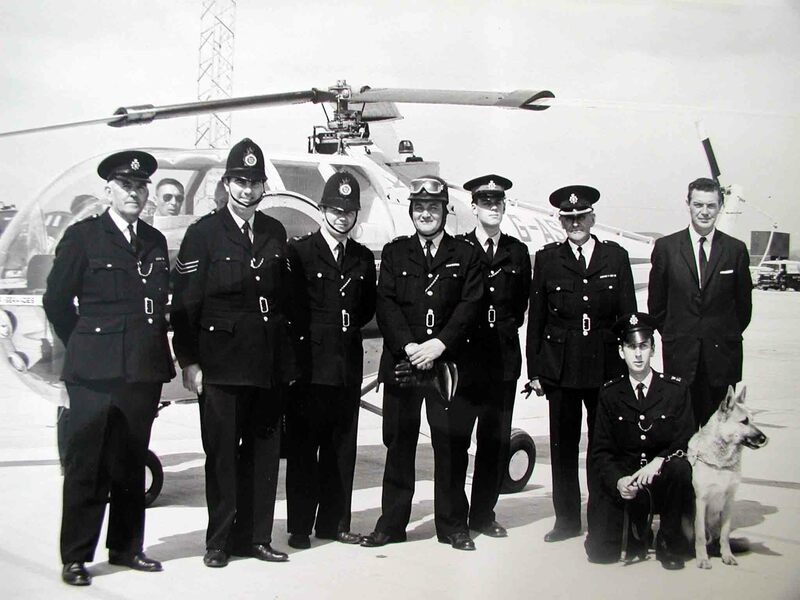 Some of the officers on duty stood in front of the ministerial helicopter for a photograph. Included in the picture, wearing a motorcycle helmet was motorcyclist Pc Percy Sharland. The local Divisional Commander, Superintendent William Voyle was not a man noted for his sense of humour but he smiled when he saw the photograph and sent it to the editor of the British Transport Police Journal at Force Headquarters with a note to the effect that the Docks Division were proud to announce that it had taken possession of a police helicopter and that Pc Sharland had been trained as its pilot. When the article was published it certainly came as news to the chief constable and it raised a few eyebrows until the truth came out when everyone could see the funny side of it. 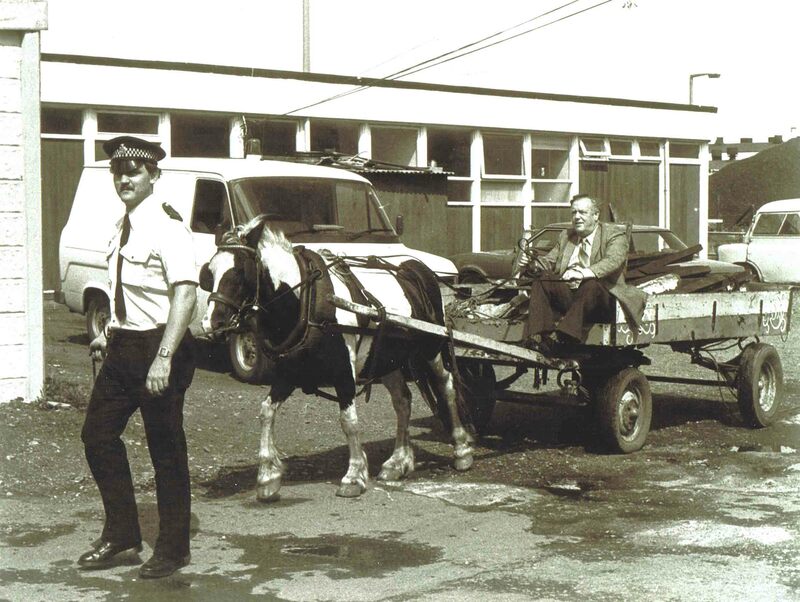 Not to be outdone, several years later, when Detective Constable Derek Harris confiscated a gypsy horse and cart during a scrap metal investigation at Cardiff Docks, a later Superintendent also sent a similar photograph to Force Headquarters, saying that the Division had recently taken delivery of new covert transport for undercover operations. The then Chief Constable, Kenneth Ogram, was probably unaware of the helicopter story and clearly showed that he had even less of a sense of humour. Putting it plainly, he blew his top!